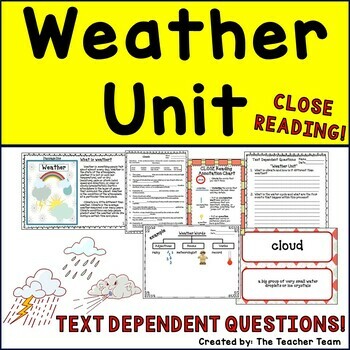 Engage your students with this fun Weather Unit! 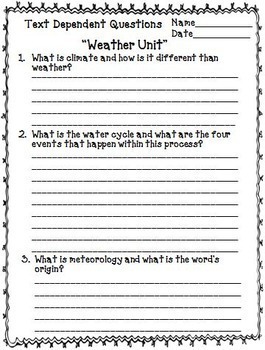 It contains passages, questions, and a wide variety of resources needed to teach a rigorous unit on weather. 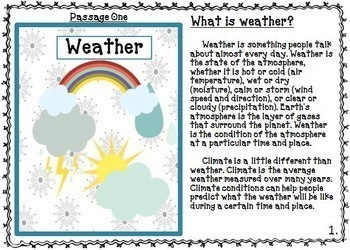 It includes nonfiction passages for CLOSE Reading to help teach your students about weather (not familiar with CLOSE reading? It’s okay, we have instructions and anchor charts to help you incorporate it into your teaching). There are text dependent questions aligned with each passage, a set of vocabulary cards with definitions to accompany the passages, and much, much more. 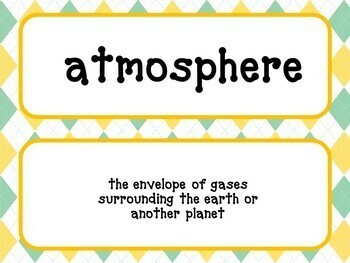 A variety of other graphic organizers and activities are included as well. We do encourage you to supplement with any other books, videos, and websites that you already use; they will blend nicely with our CLOSE reading passages. You can use this unit in its entirety, or “pick and choose” the components to meet the needs of your students. •	Venn Diagram to compare and contrast similarities and differences. •	A CLOZE worksheet (a fill-in the blank) worksheet and answer sheet to accompany each passage to assess vocabulary attainment and your students’ ability to utilize context clues.